Sunshines kids from the Namib Desert Environmental Education Trust (NaDEET), a non-profit trust and environmental education organisation located on the NamibRand Nature Reserve with the SunCycles e-cycles. The children and adult participants learn first-hand about sustainable living, bio-diversity and environmental literacy with outreach programmes. An estimate of 96,000 residents walk to work in Windhoek as urban centres all over the world are facing transport problems, according to the City of Windhoek Public Transport Department. 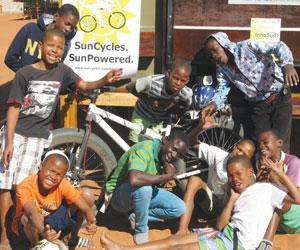 SunCylcles, a Namibian based venture that builds and retrofits ordinary bicycles with battery powered solar energy may have a solution. Marita van Rooyen speaking to the Economist said that green transport can play a significant role in mobility problems facing residents. “The taxi is the most obvious choice for many commuters but only 52% of Windhoek’s population can hardly afford public transport,” she said. Bernard Walther and Marita van Rooyen initiated the project after brainstorming on ideas on how to make public transport affordable. The idea was born in 2013 when the pair started experimenting by building electric bicycles at Walther’s home in Germany, who is by profession an industrial engineer and the technical lead on the project. At the end of 2014 the first prototype was born, leading to the creation of SunCycles. Soon a shipping container full of bicycles and electric kits for retrofitting the existing bicycles arrived with spare parts and solar recharge options. “The journey has been great so far, the response from the public has been very positive and people are excited about the possibilities that e-bikes can bring to Namibians,” Rooyen said. One of the greatest challenges according toRooyen, is the cost of importing electric parts for our bicycles. “It makes the final product quite pricey which goes against SunCyles idea of providing affordable, environmentally friendly transport alternative to locals, and more specifically to low-income populations,” he said. Rooyen added that the price of imports makes it more expensive than it should be as they are forced to shift their target market to the middle/higher income bracket. Despite that the team is still hoping for a much cheaper alternative. “We’re still hoping to find a solution to this problem so we can make a difference in the lives of the majority of Namibians, and not only in a select few. To upgrade an exisitng 26inch bicycle cost NS7900 for the kit, which includes an engine and a battery. Which excludes labour of N$250 per hour,” she said. The fitted batteries can go for up to 1000 up to 2000 charges and discharges with the ability of the battery slowing down after clocking in a mileage of 20,000 kilometers in a battery life cycle, which is 100 times more efficient than a car. “We also try to sell solar recharge with our bikes, to make it even more sustainable. The solar recharge further makes an impact on the consumer as it offers and alternative form of electricity, this is especially useful for rural area that are off the electricity grid. The bicycle battery has a USB slot that can power small electric devices such as cellphones, lights and even laptops,” she said. “Our future aspirations still are, and always will be to provide a sustainable transport alternative to individuals at large, and to make a difference on roads, making them safer, reduced carbon emissions and to make the country less dependent on fuel imports,” Rooyen said. Meanwhile, that is not all that SunCyles is all about, on top of producing solar powered transport, they are also big on education. Working together with organisations such as NaDEET (Namibid Desert Environmental Education Trust) and Pay (Physical Active Youth), to empower the youth and future leaders in making informed decisions. Going forward, the company has aspirations to scale up by providing a sustainable transport alternative to become the first carbon-neutral country in the world, independent from fuel, coal and electricicyt imports. “The SunCycle dream is to offer a sustainable, affordable, and environmentally friendly form of energy and mobility to make solar-powered electric mobility accessible while also transferring knowledge, skills and know-how regarding electric mobility,” she said.